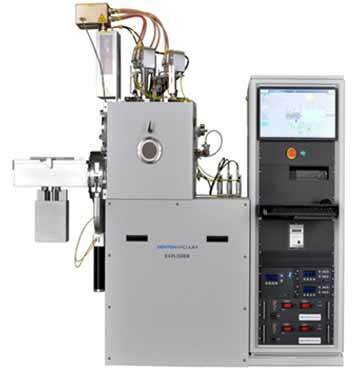 The Explorer platform is a versatile high-vacuum R&D and pilot production platform that can be configured for electron beam (e-beam) evaporation, resistance evaporation, or magnetron sputtering. Ion-assisted deposition is available as an option in all three configurations. The Explorer is available in a semi-manual mode or can be upgraded to a fully automatic mode with one-push button automation to reduce system downtime. Ask us about ProcessPro. With a flexible chamber size, the Explorer can accommodate substrates as large as 8 inches. The sputtering configuration accommodates DC, Pulsed DC, and RF sputtering with co-sputtering capability. Optional proprietary PEM technology is available for closed loop control transition mode and high rate reactive sputtering of metal oxides and nitrides. We offer multiple pumping options – diffusion, cryogenic and turbo – in rear or bottom placement providing a system that will meet your process requirements and provide the rapid pumpdown you demand for high productivity.